Hydronic heating was the first form of radiant heat, used by ancient Chinese civilizations and further developed by the Romans. 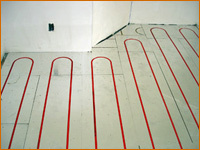 Today’s hydronic floor heating systems feature PEX radiant tubing that is usually installed in concrete. For interior applications, the tubing is sometimes installed in a concrete mass called Gypsum Concrete or “Gypcrete,” or, more commonly in the grooves of the advanced Rau Panel system. The pre-cut wood panel method is known as a low-mass or modular board underlayment system, and is ideal for remodeling as well as most new construction projects. Hydronic heated floor with Pex tubing inserted into Rau Panels. The heating element for a hydronic system involves flexible tubing and specially treated water. 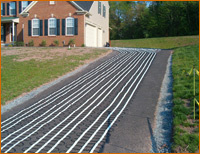 Hydronic heated driveways use a closed-loop tubing system to heat the surface of the driveway. The tubing is generally made of a durable polymer (PEX tubing) or synthetic rubber to circulate a mixture of hot water and propylene glycol (antifreeze). The fluid is warmed to temperatures between 140 to 180 degrees F to deliver enough heat throughout the snow melting system. The PEX tubing can be installed under a variety of mediums, including concrete, asphalt, stone pavers, etc. Successful operation of a hydronic heating system depends on proper tubing spacing and layout. Tubes are usually laid out in a spiral or serpentine pattern for even heat distribution, making initial installation a bit more challenging than that of electric radiant heating systems. A water heater (boiler) is the heat source for a hydronic heated system, which can be powered by any energy source that satisfies the btu requirements, including natural gas, electricity, oil, wood, or even solar collectors. A circulating pump and supply and return manifolds, installed in an easily accessible location, transfer the liquid between the heat source and tubing. Flexible Power Source Options (Low Operating Costs) – Because the boiler of a hydronic radiant heat snow melting system can utilize natural gas, oil, wood, or other cheap fuel, the operating cost for large hydronic systems can be lower than that of an equally sized electric radiant heat snow melting system. Retrofitting an asphalt driveway with radiant heat. Snow melting cable is placed on the original surface and new asphalt is then applied over the heat cable. 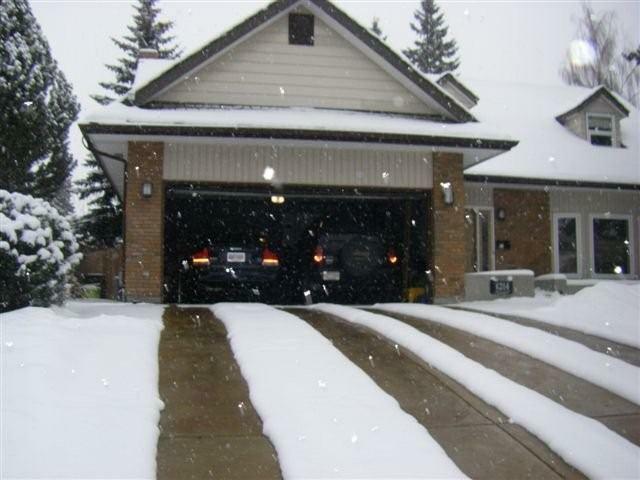 Electric heated driveway systems are generally more efficient than hydronic systems. Electric cables heat up instantaneously, whereas the liquid within hydronic tubing takes a while longer to be heated up before the snow begins to melt. Installation of electric systems is fairly simple for the “do-it-yourselfer”, and heat cable is also available in mats that can be rolled out for simple installation. The mats feature cable that is pre-spaced, attached to a durable fiberglass mesh backing. They can be easily rolled out to heat tire tracks or an entire driveway. This flexibility is invaluable in retrofit applications, where hydronic system installation is more evasive, and costly. With both radiant snow melting systems, you have great flexibility in terms of the installation configuration (even more so with electric systems). Instead of heating an entire driveway, you may want to install heat cables to only melt snow in the tire tracks of the driveway. The heat cable for radiant snowmelt systems can be customized to heat just about any type of odd shaped area, large or small. Install radiant heating cable under the entire driveway pavement. Install only an 8-10 foot wide strip of heating cable up the middle of your driveway or main traffic area. Install two 24-inch wide tracks of radiant heat cable up the middle of your driveway. Electric heated driveway with heated tire tracks in concrete. Electric radiant heat systems usually cost less to install, and are much easier to install in small spaces. The installation of a hydronic system is much more labor intensive and costs more for materials. However, for larger systems, you will probably save more money on the heating bill compared to electric warm flooring. Make sure you work with experienced professionals who also provide system engineering and design services, included detailed CAD drawings. Warmzone is one of the best radiant heat providers that you could hope to find. They will work closely with you to ensure that the radiant snow melting system you install is the absolute best system for your specific needs.